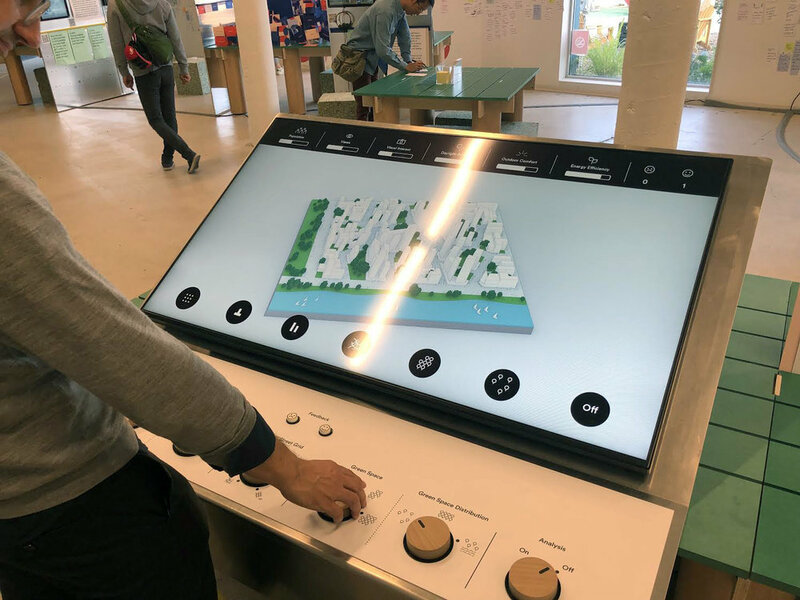 We recently worked with Sidewalk Labs, the urban-innovation organization within Google’s parent company Alphabet, and Montreal-based experiential designers Daily tous les jours, to create an interactive prototype for community engagement: the Plan Your Neighbourhood exhibit launched as part of 307, the experimental workspace at Sidewalk Toronto. For the prototype, we generated thousands of urban design scenarios using our Smart(er) City methodology: testing combinations of design inputs like type of street grid, population, building heights, the amount of green space and how it is distributed, and finally, what shape the buildings take. These scenarios were then evaluated according to various performance criteria such as outdoor comfort, energy efficiency, views, daylight, and pedestrian enjoyment. Visitors explored these combinations by toggling wooden knobs to change design inputs. This allows users to create the type of neighborhood they want, and to then understand how those design decisions impact the functioning of a complex system like a city. The goal of community engagement platforms like Design Your Neighbourhood is to encourage design and introspection in equal measure. Our favorite example from the opening weekend was the participant who started with the lowest population and the most green space (she wanted a backyard of her own), but quickly realized that this led to low scores for outdoor comfort and energy efficiency (two things she valued). By making a few quick adjustments she found an option that performed well for those two priorities; the kind of compromise solution that would greatly improve the performance of North American suburbs. People have opinions about the places they live and work, but there is rarely a common language for describing a neighborhood’s essential qualities and its performance for the people who live there. An engaged process allows us – the designers, developers and planners – to balance various stakeholders of the urban environment and to proactively and responsibly accommodate growth. The Plan Your Neighbourhood prototype, and our KPF Scout and CityBot, can be used by city agencies and developers alike to engage with the public in the very early stages of the planning process. Their application is easily applied to specific projects around the world for the public to explore trade-offs between various options and also to understand the general process more fully. Tools like these create a shared understanding that facilitates effective communication, and allow the next generation of smart cities to live up to their potential as places for people.